[U.S. Magistrate Judge Sheri Pym] granted the Justice Department’s request for help unlocking the phone of terrorist Syed Rizwan Farook, who, along with his wife Tashfeen Malik, murdered 14 people from his office at the County Health Department in San Bernardino, California, in December. The couple was later killed in a shootout with police. [The phone is actually owned by Mr. Farook’s former employer, San Bernardino County. The county has given investigators permission to search the phone, but county officials don’t know Mr. Farook’s passcode, according to federal prosecutors. 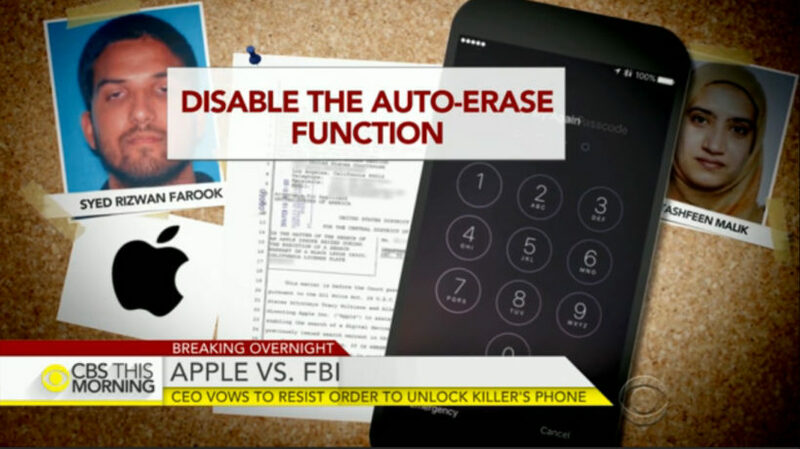 Apple said that the FBI had requested that the tech giant produce a new version of the iPhone operating system which circumvented key security features to install on Farook’s phone. “In the wrong hands, this software – which does not exist today – would have the potential to unlock any iPhone in someone’s physical possession,” Cook’s letter said. 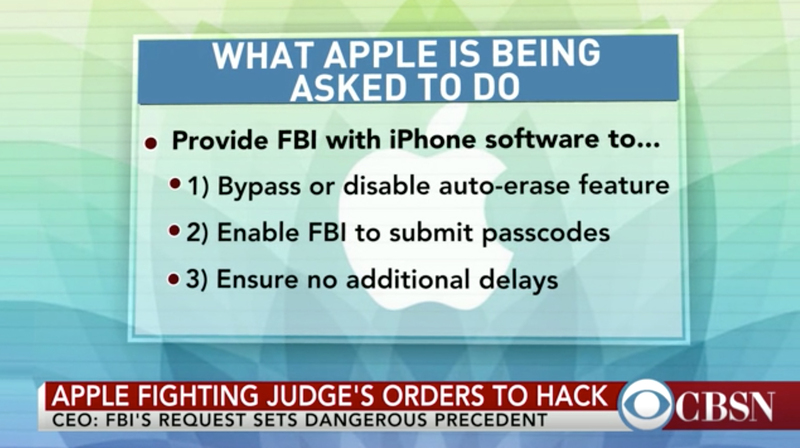 While the FBI did not describe this as a backdoor into the iPhone, complying with the request would “undeniably” create one, and limiting its use to the Farook case could not be guaranteed, it said. “The government suggests this tool could only be used once, on one phone. But that’s simply not true. Once created, the technique could be used over and over again, on any number of devices,” Cook also asserted in his letter. Apple said in the letter that it had “great respect for the professionals at the FBI, and we believe their intentions are good.” “We have no sympathy for terrorists,” it said, adding that it did not oppose the order lightly. But it said that the FBI was proposing “an unprecedented use” of law dating from 1789 to justify an expansion of its authority, the implications of which were “chilling.” “If the government can use the All Writs Act to make it easier to unlock your iPhone, it would have the power to reach into anyone’s device to capture their data,” it said. 1. For what reason does Apple CEO Tim Cook say his company will fight the federal judge’s ruling? 2. In refusing to comply with a federal judge’s ruling, what does Apple accuse the government of trying to force Apple to do? 3. What does Mr. Cook call for in his public letter posted to the company’s website on Wednesday? 4. A federal judge has granted the Justice Department’s request. If San Bernadino County owns Farook’s work phone the FBI needs to access and has given them permission to access it, why haven’t they done so? 5. What does Apple say the software the Obama administration wants them to create would do? a) Many have said this is not simply a privacy vs. security issue. What do you think? Explain your answer. Farook and his wife took pains to physically destroy two personally owned cell phones, crushing them beyond the FBI’s ability to recover information from them. They also removed a hard drive from their computer; it has not been found despite investigators diving for days for potential electronic evidence in a nearby lake. Farook was not carrying his work phone during the attack. It was discovered after a subsequent search. It was not known whether Farook forgot about the phone or did not care whether investigators found it. There may be critical evidence on the phone, the government argues in the filing, because the data wasn’t backed up to cloud storage for a month and a half before the attack. “Evidence in the iCloud account indicates that Farook was in communication with victims who were later killed during the shootings perpetrated by Farook…and toll records show that Farook communicated with Malik using the subject device,’’ the filing says. The filing also says San Bernardino County officials have told investigators the automatic backup feature was turned on when the phone was given to Farook. Before Oct. 19, backups occurred “with almost weekly regularity,” it says.